If you are reading my blog for a while and especially if you are following my Instagram and Pinterest boards, you know already how much I love colourful destinations. Especially if you are living in a country with such a long and grey winter, the sight of a patch of colour may completely change and enlighten your day and your mood too. 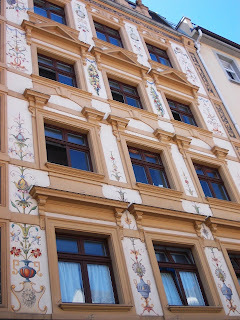 For all those who, like me, all they need for calling it a good day is a cute painted house or a street corner, I bring to you my top colourful destinations in Germany. With its perfectly lined old houses with windows generously decorated with flowers, Rothenburg ob der Tauber is one of the most picturesque destinations I ever visited in Germany. The old cobblestoned streets kept their Middle Ages charm and if not the tourists with their flashes and search for a selfies spot, you might think that you are back in the old times. 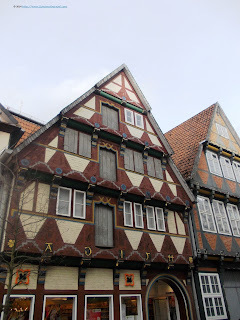 3 stops away and less then three hours away from Berlin, Celle is the best place to go if you love the half-timbered houses. Everywhere you look around you in the old city center, you are overwhelmed by the beautiful decorations. If you speak German, you will also find some short inspirational words written on the top of the main entrance, an encouragement for locals to be better persons and members of the community. If you are bounded for the South of Germany, you have to stop here for more than a couple of hours. Freiburg (im Breisgau) although less known as a popular destination in Germany to the rest of the world, has plenty of colourful gems. From the old main square with the painted facades to the side streets with small benches in the front of the store where you can rest and admire the pastel houses, you have a long list of places to see and eventually fall in love with. Minutes of walking away from Switzerland, Konstanz was a surprising destination for me, especially for its painted houses and varied range of cuisines. Although I enjoyed to wander around and recharge my energies while visiting Island Mainau I also tasted the delightful colours of the houses, many of them telling full stories of old local histories. On the way to and from the famous German castles of Neuschwanstein and Hochschwangau, Füssen is often neglected as a destination in itself. One of the reasons is, you are right, the colourful houses that are related either to regional histories or do share a specific aspect about the original inhabitants of the house, such as social status or profession. A darling of the film industry, Görlitz displays a surprising mix of styles and architectural details, with a range starting from the classicism to Art Nouveau. 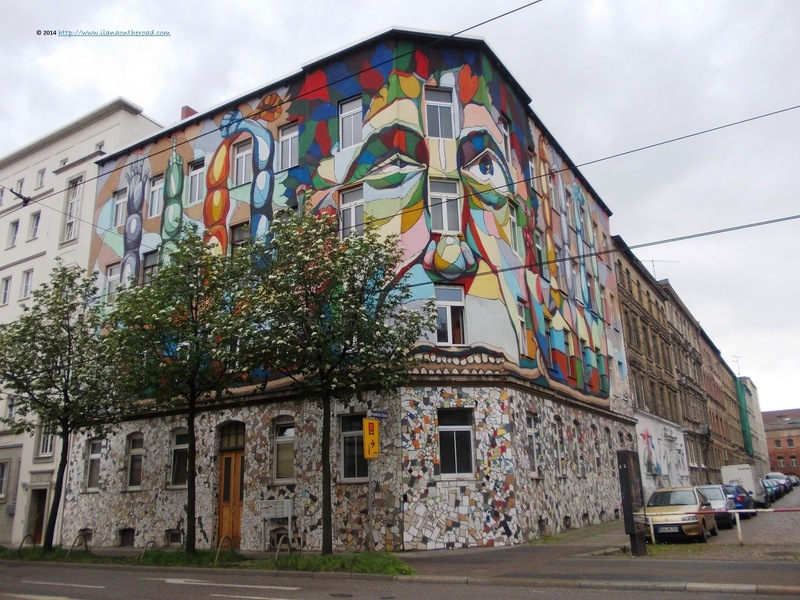 Besides the facades of the newly rebuild houses from the central area with funds donated by a mysterious lover of this former GDR city - keep in mind to check also the colourful doors. As in the case of the painted houses in the South of Germany, the massive doors used to send a message about the social status of the owners too. 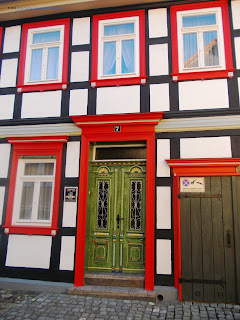 Shortly upon arrival in the Harz-mountain town of Wernigerode, I could hardly stop from taking pictures after pictures of the colourful houses and their matched doors. 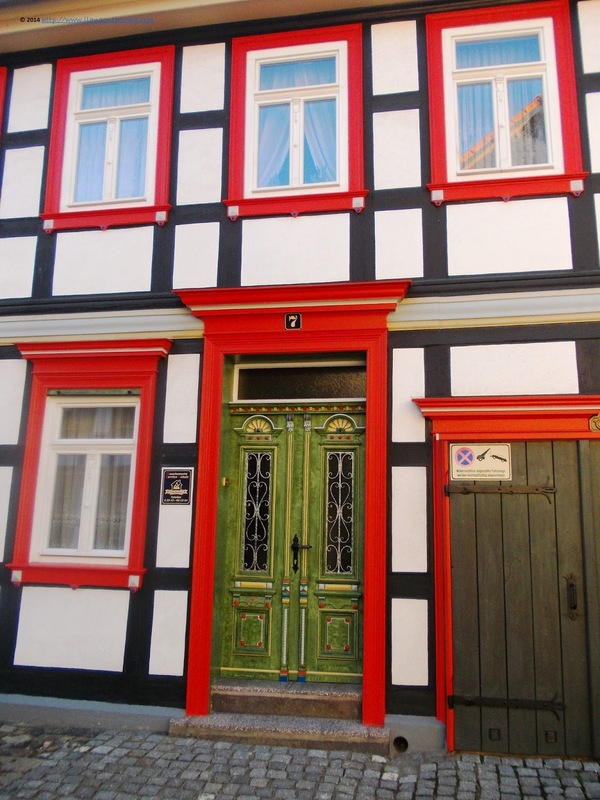 Although most big towns in this area, like Quedlinburg, do have full streets bordered by charming half-timbered houses, Wernigerode was for me the most stylish and pleasant to the eyes from all of them. I bet that right now, covered by snow, it looks even more beautiful, and until the winter is still around, I might plan a come back only for such views. 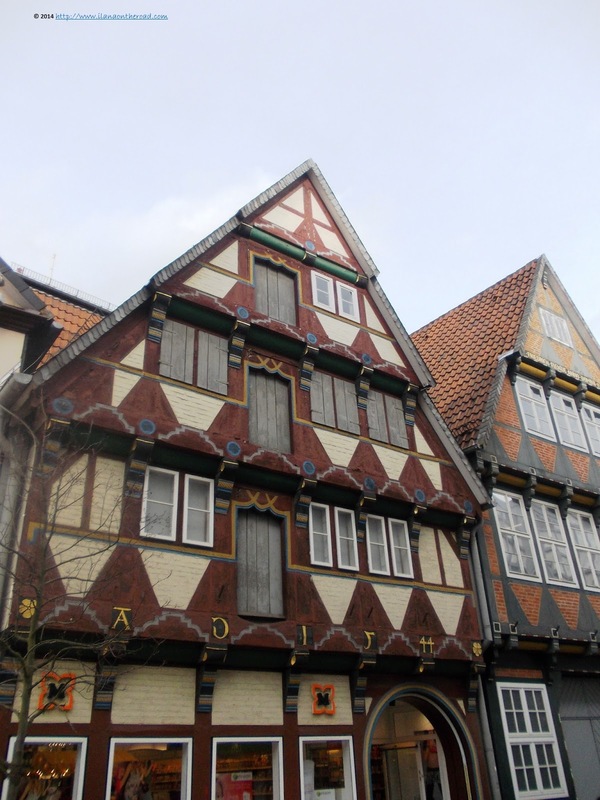 A city of middle-class tradesmen, less than one hour away from Hamburg, Lüneburg was one of the few cities in Germany where the original architecture was completely preserved as spared by the bombings during WWII. Although compared to the other destinations I've mentioned, there are not too many extravagant colours, the diversity of architecture and of the stones used in construction offer a great visual perspective on history and living habits in this part of Germany. There is one thing that both Halle (an der Saale) and Lüneburg, do have in common: the salt reserves which in the Middle Ages were considered as precious as we do value the gold nowadays. But there is also a colourful thread that might explain why I added this place to my list of top colourful destinations in Germany. However, it has to do more with modern times than with the old stylish bourgeois architecture - although in the central area there is still plenty of houses with interesting doors and classical shapes. On my way to the train station, I stumbled upon an area covered in creative street art patterns, which made the otherwise boring looking buildings look alive. The creativity displayed there can easily compete with any other famous street art locations in Berlin and in the world. What about you? What are your top colourful destinations in your country or in Germany? Wow, all those places in Germany are indeed colorful! I totally love Freiburg! 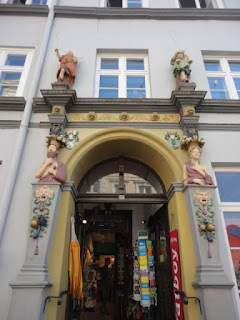 But the architecture of Halle (an der Saale) seems so interesting and kind of reminds me of something, not sure what. Will have to go and check out! Nice! There is a full article on the blog about Halle so I bet you can find many unique information about this place! I love traveling in Germany. Thanks for the tips on colorful places to visit on my next trip! Thanks! Let me know if you need additional details! I love to discover German destinations too! I've never been to Germany, but if I choose to visit this country, it would have been for architecture and vibrant colors like this! Thanks for sharing lovely photos. Thank you! I hope you can make it to Germany sooner than later! I have yet to visit Germany, but with so many wonderful suggestions I should make a plan to go soon!